This is a tool I created many years ago to provide Data Backup capabilities from within the WinPE Environment as well as within a running Windows Environment. It can also detect Windows installations on External or slaved drives as well. It is useful for users that will be reinstalling a computer or when they need to transfer their data to a new computer. GotchaDATA.exe is a completely portable file. It should work in any windows version from Windows 2000 and newer. It should work in most if not all WinPE Environments. It does not require any .NET installations. Gotcha Data Backup is meant to backup all of the most important areas of the user profiles. For instance... Desktop, Documents, Downloads, Videos, Music, Pictures, Favorites, Internet Favorites/Bookmarks, Microsoft Office PST Files and profile settings, Mapped Drives, and more. It also has the ability to backup some important System Files and settings. For instance... Windows and Microsoft Office Product Keys, System Drivers, Fonts, WiFi Profiles, and so on. A great advanced capability is the option to Move files instead of Copy files. This comes in handy if you will be reinstalling a computer without formatting the drive. Since Gotcha will quickly be able to move the files you need backed up into a folder on the same drive very quickly. This can save you hours gathering the backup if you use the normal copy operation that other backup tools use. Once you have created your backup you will notice it creates a folder in the location you chose called "Gotcha!". In this folder you will have a new file called GotchaRESTORE.exe which is what you will use when you are logged into the Windows User account you wish to restore data to. It will ask you for the path of the Backup. Just browse into this "Gotcha!" folder and select the Dated folder of your backup. Next you just select the profile you will be backing up. Now select any System or User files you wish to restore. Gotcha does not restore Product Keys... so you can browse through your dated backup folder and find the "System\Keys.ini" file which has the keys in it. Also Drivers are backed up in "System\Drivers". You will be able to restore them using the built in Windows method for restoring Drivers. If you have any questions or if you run into any problems please ask here. If you have any requests for improvements I would love to hear them. If you are a developer and are willing to help develop this project please contact me and we can see if it can be worked out. Thanks for the new file, I have used it since long time ago with excellent results. I have a comment: Just downloaded this version (Gotcha Data Backup 17.11.30.0) but When you run it says version 16.11.13.0, maybe you uploaded wrongly a previous version, or forgot to update the version tag on the file. By the way Avast is detecting a false positive yet, I sended the file to re-scan on their lab telling them it is a false positive. Hmmm... I'll take a look as soon as I get home and make sure it's the correct file. Thanks for letting me know. Thanks for submitting the false positive report as well! Re-downloaded, now it is in fact version 17.11.30.0, also good news Avast AV is not complaining anymore about a virus (false positive). Thanks to you for your quick response, I like this great tool a lot. Your welcome! I'm glad you like it! I'm also glad the false positive is gone. :-) That was the main reason for this release was to compile it with a digital signature. 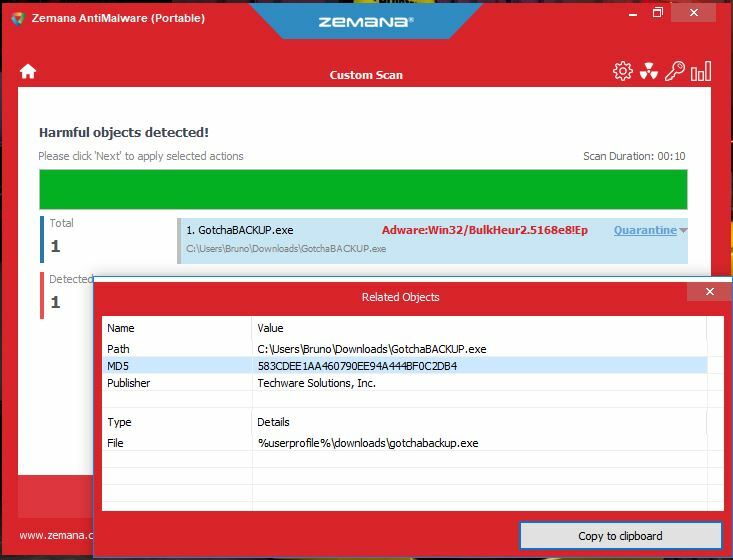 Usually most antiviruses do not flag a file with a valid digital signature since it means the program is registered to a legitimate business. Is this on a computer that has windows on it? If it is launched within winpe it should recognize any drives that have windows installed on it. Or if it is in windows it should check for any external windows installations as well as the current windows. But if you try to open it on winpe ame there is no windows installations found it would give that error... since there would be no profiles to backup. Please let me know more info on how you are using the software and hopefully we can figure out what's going on. Please submit it to them as a false positive. If possible have them whitelist the Publisher: "Techware Solutions, Inc." Since that is my company and all of my programs will be registered with that digital signature. Cool app! Just a question (or a request). Does this app accept any command prompt parameters? I was thinking it would be cool if you could automate it. (Switches for what folders to backup, keep x number of backups in same Gotcha! folder, etc) If it could be done completely command driven, a Scheduled task could be put into place. I have not implemented any switches yet. But I do plan to add some in the future. I mean it would be much better/more useful to have the possibility to pass to the tool only one parameter, the path to a ".ini" (or similar) file, the kind of switches parameters needed would be IMHO too many and too complex to be actually used on command line, and users would have anyway to use a batch or similar to script them in practice. Yes I agree. Usually when I add switches I do both. The main settings switch would point to an ini file. v18.7.18.0 on W10x64en, backup to at UNCpath or mapped network drive, say Backup Complete, but nothing are copied to the path. Honestly there is no reason I can think of that the backup did not create your "Gotcha!" folder in your chosen locations. Is there anything special about the account you are logged into? Are you able to create folders and files in those locations manually? If you can think of any more details that can help me track down your issue it may help me figure out why it is not working for you. I see the DriverGrabber v2.0 Bate 10 popup and do it's work, and there after all the Copy tasks, with v18.7.18.0 no popup or copy info beside the "Backup Complete" status. Are you browsing for the path you want to create your backup or typing the path in the input box? If you are typing it... it will be ignored because the program has no code to read the typed text. It must be writing the files somewhere... since it would pop up with many file write errors if it is not able to write the files. The program checks to make sure the files are written. If for some reason the input for location is read as blank... I think it automatically writes the files to the root of the drive... or it may write then next the the gotcha exe file. I dont remember which. Please search for a folder called "Gotcha!". It must be somewhere. I browse for the location, so I also know it can see it. Just another test With v18.7.18.0 location C:\bak, only fonts and now it works. Also it I run it again with full system, and also now it works with D:\bak and M:\bak ???. And now it works every time I close and restart the tool, I have not rebooted or changed a thing, just used the V2014.1.31.1 release at different location, and now v18.7.18.0 also works. Yes I had tried to close and restart the v18.7.18.0 release multiple times, and stored at multiple locations. Seem I just need to keep both release with me, so if it happens again, I may have a fix. @GertJ I don't know what could have caused the issue. There isn't any changes between v2014.1.31.1 and v18.*.*. * that I can think of that could cause an issue like that. If more users have a simular issue maybe we will be able to narrow it down. For now I think maybe it is some random glitch. Who knows maybe an antivirus program or something was causing an issue. Very odd indeed. I'm glad it's working for you now.